Do yourself a favour and watch THE BREAKFAST CLUB instead. PITCH PERFECT is a movie made possible by the massive commercial success of the TV show GLEE, and BRIDESMAIDS. It combines a female centred gross-out humour and bonding comedy with remixed and mashed up show tunes, all with a day-glo tongue-in-cheek sensibility. It's a movie that both mocks and loves GLEE and all its antecedents. This was going to make it a tough sell for me. I love musicals as much as the next man, but I don't get on with GLEE. I don't like that hyper-pop-music style of singing or the caricature characters. 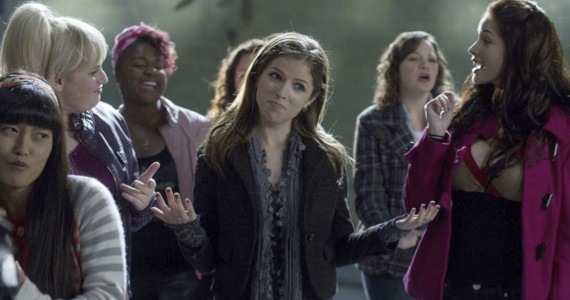 But I *did* like BRIDESMAIDS, so I went into PITCH PERFECT with high hopes. My viewing experience. I could see characters and lines and pratfalls that were making everyone else laugh, and an intellectual sense, I could vaguely admire them, but I just wasn't laughing. Maybe it was that I couldn't buy Anna Kendrick - the sweetest, most wholesome actress working in cinema today - as an emo rebellious teen? Maybe I didn't really care about the thinly manufactured rivalry between the all-male victorious campus glee club and our gang of uptight, old-fashioned female acapella singers? I knew that as much as Kendrick's Beca claimed she was too cool for school, she was eventually going to alienate and then re-woo her sweet boyfriend Jesse (Skylar Astin). And, OF COURSE, we were cueing up for a final showdown where the girls get it together, mash up monster pop hits and take the prize. In between all that predictability, the vomit jokes and the fat jokes weren't floating my boat. And are we really okay with some of the racially tinged jokes about Asians? In fact, the only real joy I got from this movie were Elizabeth Banks and John Michael Higgins as the scabrous glee contest commentators - genuinely edgy and unpredictable! That, and the fact that it prompted me to go back and watch THE BREAKFAST CLUB, which is to this mush as Adele is to Lea Michele. PITCH PERFECT opened earlier this year in the USA, Canada, New Zealand, Taiwan, the Philippines, Cambodia, Slovenia, Iceland, Singapore and Portugal. It is currently on release in Australia, Israel and Brazil. It opens this weekend in the UK, Ireland, Germany and the Czech Republic. It opens on December 26th in Belgium; on January 3rd in the Netherlands; on February 1st in Spain; on February 7th in Argentina and Sweden; on February 21st in Denmark and Lithuania; on March 22nd in Norway and on May 8th in France.